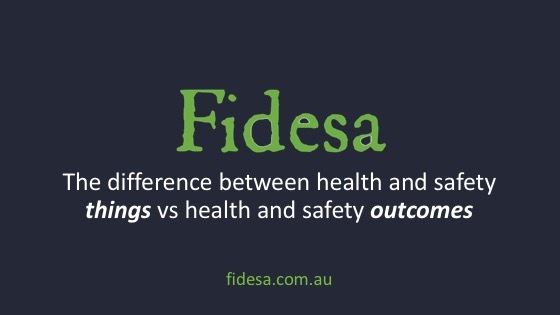 Our mission at Fidesa is to help clarify and simplify work health and safety for small business owners like you, which doesn’t just give you safer and healthier people, we also help you improve your businesses top and bottom line too. Better people, better business. Now this answer will help you get started no matter whether you are literally just starting a business, or are just starting to get more organised with your health and safety in your existing business. Before I give you my answer to Brenton’s question, I wanted to just flag with you that it sort of suggests that we need some ‘thing’ in place for health and safety, which is partly true. I talk about things vs outcomes in another video which you should check out on our website, it’s called things vs outcomes. So first, what outcome are we trying to achieve? Let’s not kill or seriously injure anyone. Sound like a good idea? It might sound obvious, but too often we get caught up in the obvious visible safety stuff like high vis clothing or signage, which often means we don’t focus on the important stuff. So how do we not kill or seriously injure anyone? First, Stop and ask yourself “how would a death or serious injury happen in my business?” Think about your own experiences, stories you’ve heard, or things that have happened in your industry. You ^will know these when you stop and think about it. Next, ask yourself “What am I doing to stop that from happening?” Just list off everything you are already doing which you think will reduce the chance that one of those deadly situations happening in your business. So 3 questions, and the answers you come up with: what can go seriously wrong, what am I doing about it now, and what else could I do to reduce the chance that someone will get killed or seriously injured? 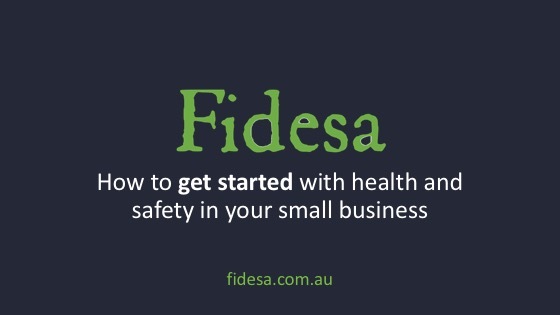 This is a great way to get started working on health and safety in your business. Notice that we haven’t talked about paperwork or procedures or checklists or a bunch of training or spending bucket loads of money. As a business owners, you need to confidently know the answers to these questions, and in particular if you figure out there is more you can do, you’ll need to take action to sort that stuff out. I often hear small business owners getting confused between health and safety things vs health and safety outcomes, so I hope this clears it up for you. Imagine a business owner you saying “My business creates amazing products for customers. Our employees are just the best craftspeople, who give our customers something they can hand down to their kids. Our state of the art software helps them get the design just right, and we are always on time”. What’s the ultimate outcome for a business to achieve? Well I think there are actually two. The first outcome we want to achieve without fail is a great experience for our customer or client, which in that example it sounds like the business owner has done. But the second outcome is that we are profitable. If your customers are amazingly satisfied, but it costs you $100 to make only an $80 product, you are not a business, you are a money pit of doom. You will fail to get your business outcome. So the things that we do in our business don’t matter unless those things help us get the outcome that we want. It’s the same in health and safety. Health and safety is not a thing, it’s not a process or a document – health and safety of people are the outcomes of great work done by those people in a great small business. There is a bucketload of things that are labelled health and safety, which don’t really contribute much if at all to the outcome of safe and healthy people. So next time you are thinking about another thing for health and safety, ask yourself, is this really going to help get the outcome I want?